In case you missed last week’s post, I’m participating in Rachel Hollis’ last 90 days challenge, and I’m going to document my progress in hopes of inspiring you to take action. In this first week of the challenge, I became even more disciplined and intentional--and I took all excuses off the table. Be sure to read last week's post to learn about the first steps to take. Setting aside a few hours on the evening of Sunday, September 30th, I started creating a plan. Then, I chunked these goals by the month, week and day. Knowing exactly what I wanted and how I was going to reach my goals, helped me to stay consistent all week. I stuck to my workout schedule, my spiritual practice and I landed a new client for my mentoring business, all because I had a clear plan. If you would like to join the challenge, it’s not too late. It’s never too late to start creating the life you want to live. I’m on a mission to help as many people as I can to live a happy and fulfilled life. However, I know that not many of us know how to get started on creating goals, so, to help you get started, I created a FREE printable workbook for goal-setting. Download it here and get started tonight! I once lived a misguided life and as a result, I played small and ignored my God-given potential. Don’t let this be you, start today taking the steps to living the life you came to live. Next week, I’ll share more on my progress. 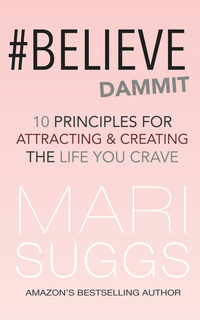 Also, if you want a little help and want to start aligning with your own purpose, then check out my book #Believe Dammit: 10 Principles for Attracting and Creating the Life You Crave. It's a perfect place to start considering your thoughts and the way you live your life. If you haven’t done so already, follow me on Twitter and Instagram and like my Facebook page. Through my social sites, I share daily inspiration and motivation of all kinds—like fitness, wellness, health, and positive thinking. Good luck on your journey and until next time!